Immigrants Subsidize, Rather Than Drain, Medicare : Shots - Health News Immigrants contribute tens of billions of dollars a year more to Medicare than immigrant retirees use in medical services, an analysis finds. Restrictions on immigration could deplete Medicare's finances. 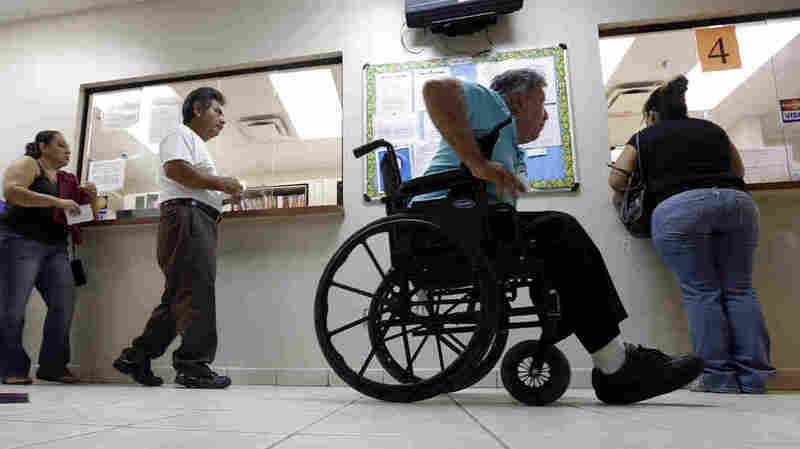 Patients wait in line at Nuestra Clinica Del Valle in San Juan, Texas, in September 2012 file photo. A study released on Wednesday finds that immigrants, particularly noncitizens, heavily subsidize Medicare, and that policies that restrict immigration may deplete Medicare's financial resources. As Congress mulls changing America's border and naturalization rules, a study finds that immigrant workers are helping buttress Medicare's finances. Immigrants contribute tens of billions of dollars a year more than immigrant retirees use in medical services. "Immigrants, particularly noncitizens, heavily subsidize Medicare," the researchers wrote in the journal Health Affairs. "Policies that reduce immigration would almost certainly weaken Medicare's financial health, while an increasing flow of immigrants might bolster its sustainability." The Hospital Insurance Trust Fund, which pays for Medicare's Part A inpatient hospital care, skilled nursing facilities, home health and hospice for the aged and disabled, had assets of $244 billion at the start of 2012, but is projected to run out of money in 2024 as the population ages, according to estimates of the Medicare trustees. It is financed by payroll and self-employment taxes. Researchers look at the effect of 29 million immigrants counted in the Census on the financing of the Medicare program. It included those who had become U.S. citizens as well as those who hadn't, but, the authors noted, probably excludes many illegal immigrants who avoided the survey. The study found that in 2009, immigrants contributed $33 billion to the trust fund, nearly 15 percent of total contributions. They received $19 billion of expenditures, about 8 percent, giving the trust fund a surplus of $14 billion. People born in the United States, on the other hand, contributed $192 billion and received $223 billion, decreasing the trust fund by $31 billion, according to the paper's lead author, Dr. Leah Zallman, a researcher at Cambridge Health Alliance in Massachusetts. Between 2002 and 2009, immigrants generated a cumulative surplus of $115 billion for the trust fund, the study found. Most of the surplus contribution came from noncitizens. The immigrants created a net gain primarily because of demographics: There are 6.5 immigrants of working age for every one elderly immigrant, but only 4.7 working-age native citizens for every one retiree. Although that ratio could change in the future, the report notes that the Census Bureau projects that the share of immigrants in the United States will increase for the next 18 years. In addition, care for immigrants also costs Medicare slightly less. The average expenditure was $3,923 for immigrant enrollees and $5,388 for enrollees born in the U.S., a difference "of borderline significance," according to the paper, written by Zallman and colleagues at the City University of New York and Harvard Medical School. The researchers wrote that changes in the nation's immigration policy that would create a path to citizenship for undocumented immigrants would increase revenues for the trust fund, as many workers would shift from under-the-table employment to work where payroll taxes were collected. Also, they would have an easier time getting higher-paid jobs. However, letting the undocumented become citizens would also increase the number eligible for Medicare and, therefore, the expenditures on their behalf. The researchers did not factor in the Supplementary Medical Insurance Trust Fund, which finances Medicare Part B to pay for physician services and outpatient care, into most of their calculations. That's because the financial trajectory of that fund is less clear, as it relies on enrollee premiums and annual appropriations from Congress. There was no significant difference between the amount spent on immigrants and U.S.-born people from that fund, the study noted. "Having ourselves witnessed immigrants dying needlessly because of lack of health care, we (and many of our colleagues) are motivated by the belief that all patients have a human right to health care. But economic concerns — including the worry that immigrants are driving up US health care costs — have often dominated the debate over immigration. Our data offer a new perspective on these economic concerns." The paper anticipates that the immigrant surplus to the hospital trust fund will continue for many years, as most of those workers are decades away from retirement. In an interview, Zallman said, "If we continue to have a steady influx of working age immigrants, we're likely to see the subsidy continue for many years to come."